Tracking at Sidereal, Solar and Lunar rates. There&apos;s a crystal timebase to set the rate. No need to tune it with a knob to get it to follow the Stars, Sun or Moon. SkyStopper also has easy to use tuning functions for precise tracking of the Moon wherever it is in its orbit. Fast Reset. The SkyStopper can rewind at 60 times its forward speed. Rewind takes 90 seconds maximum, and rewind to center takes 45 seconds maximum. You can set it rewinding before you plan to reposition your telescope. Once you have checked your charts, it will be ready again for a long tracking session. 70-90 minutes tracking time. 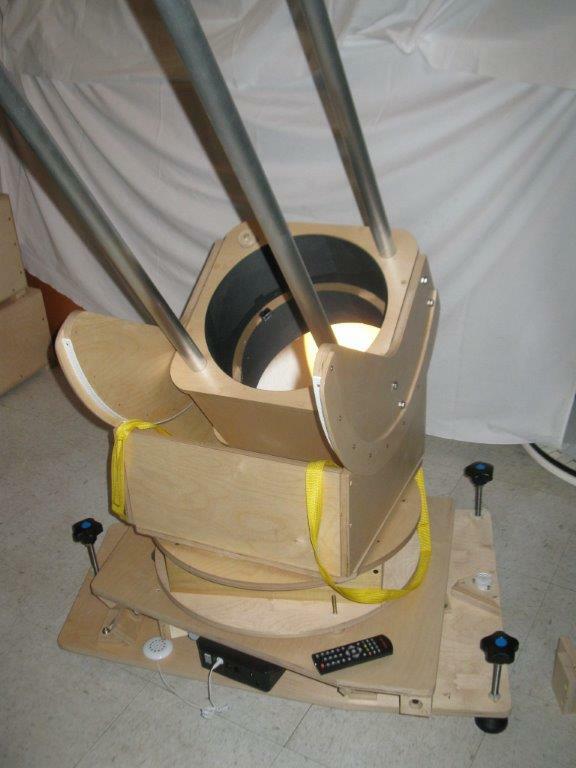 The SkyStopper maximum tracking duration is custom set after consultation with the customer and consideration of the stability of the customer&apos;s telescope. Low Power operations. With a miniature DC motor, the SkyStopper uses less than 60 mA while tracking. You should also consider using dew heaters to prevent your observing time being limited as the night gets cooler, because with a tracking platform, you will want to observe for a long time. Easy Assembly. The SkyStopper consists of just 2 major parts. All of the electronics and connections are on the rocker platform, so there&apos;s no worry of disconnecting something when you pick up the rocker at the end of the observing session. 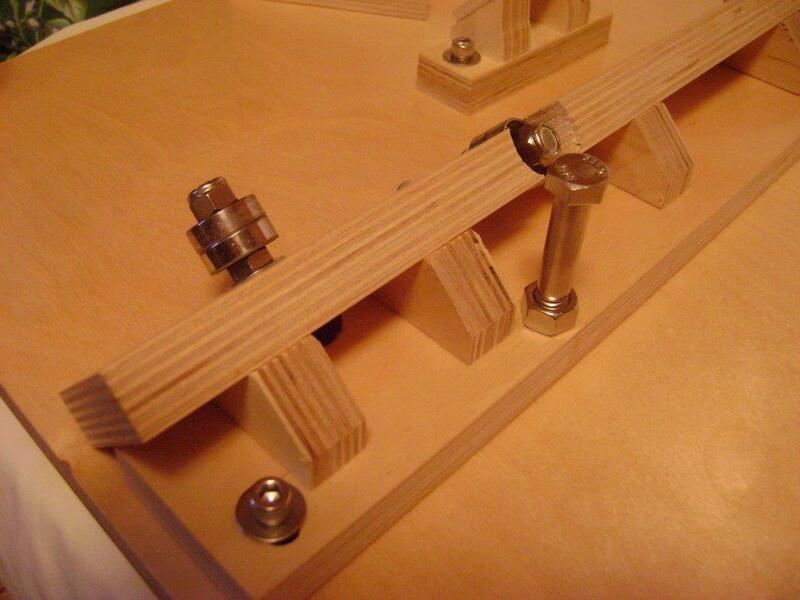 The linkage which connects top and bottom uses magnets and is easy to attach. Get it anywhere near where it belongs and it will jump into place. Levelling feet. The SkyStopper has 3 levelling feet, custom made to allow use on uneven terrain such as hills or open fields, and to allow it to be set for different latitudes if you travel. The legs easily adjust for 4 degrees of travel north or 4 degrees south. More travel range can be achieved by pretilting the platform before levelling it. Stainless Steel rods, screws, brass and stainless steel nuts and bolts are used wherever possible. The remaining metal parts are plated steel. Your SkyStopper also comes with 4 coats of clear outdoor gloss verathane to resist weathering. ST-4 Guide Port. The SkyStopper supports the industry standard ST-4 connector, (RJ11) and can be guided in right ascension and declination. The range of guidance in declination is more then 1 degree in each direction. Accurate declination guiding in any part of the sky. Thanks to the triple axis actuator on the SkyStopper, you can arrange that the declination guiding is perpendicular to the RA direction, even near the east and west horizons where legacy platforms cannot guide at all. The triple-axis SkyStopper can implement 2 orthogonal directions of guiding anywhere in the sky. In addition to the above essential features, SkyStopper also has the following standard features to make it easier to use. The Adjustable Bubble Level. allows precise altitude alignment at your preferred observing location, and easy ways to get polar alignment at other locations. Step 1 is always to level the SkyStopper according to the bubble level. Then turn the apex knob a few turns in the proper direction according to a formula, to ensure that the axis is pointed at the altitude of the celestial pole. The rest of the polar alignment process can be done using a star near the meridian. A chart is provided with the turns amounts, but generally it&apos;s about 8 turns per degree of latitude. Based on the measurements of the telescope&apos;s stance, calculations are done to ensure and report on the absolute stability of the platform, both at home and when travelling to other latitudes. You can know in advance whether you will need to restrict the travel time to ensure greater stability. The IR remote sends signals to the controller using a separately positioned receiver which can be positioned at a convenient location either by the eyepiece or for instance near your power tank. The SkyStopper can also learn a new remote control, according to a simple procedure, so you will never have to worry about losing the remote control. It also responds to the power code, so a universal remote can be configured to search for the Skystopper&apos;s standard codes. The controller has an optional speaker to provide audible acknowledgement of commands from the remote. That way you don&apos;t have to be able to see the display to ensure that your command was received. The speaker is intended to be audible for a short distance, and can be positioned to be heard effectively. The SkyStopper controller is designed from the ground up be used on custom made platforms. It is configurable to adapt to the exact dimensions of the platform including the pitch of the drive rod, and the gear ratio of the motor, and can be calibrated to compensate for any geometric inaccuracies of the platform, and of course to compensate for the varying rate of motion required due to the use of the tangent arm hookup. The controller is fully programmable for different sizes of platform, and can be retrofitted onto legacy or home-made platforms which use a tangent arm or even powered wheel to give them some of the advantages of the SkyStopper in terms of features and tracking accuracy. The controller supports unipolar stepper motors and low power dc motors. Because the SkyStopper computerized electronic controller is custom made, it can incorporate improvements suggested by customers or thought about during testing and use. I designed the electronics and programmed it, and it has every feature I can think of to make the SkyStopper better to use. Below is a partial list of features added during beta testing. These features are standard for the SkyStopper going forward. I thank the beta testers who through their comments and ideas have contributed to improvements which have made the SkyStopper better for everyone. As a bonus, they got all the features too, at no extra charge. Pricing now reflects the inclusion of all the features. All features listed here are included in the basic price. Part 1. Physical changes to the design. Positive Stop Bolts to prevent the platform going off the bearings at the end of travel if the linkage is not connected. If a heavy telescope is on the platform, it could otherwise be hard to re-center the platform. DC motor with velvety smooth operation. The inertia of the motor steadies the rotation rate and makes the platform track even smoother than the 100 times per second adjustments would do. It runs so quietly you will have to strain to hear it, and there&apos;s no vibration. Lower power audio driver was achieved with a clever software change and a different transistor. This implementation change has increased the battery life by a factor of 4. The Stronger Magnetic Linkage allows use with unbalanced telescopes and extra counterweights. It also enables the platform to be used for telescopes that it was not custom designed to handle, but you are responsible to ensure stability of the telescope on the platform against tipping. Heavy duty one-size-fits all single-axis platforms can be made. The remote IR receiver with extension cable allows easy use of the remote while at the eyepiece. Different placement of the pedestal to cancel rod wobble effects. The uncorrected rod wobble is now measured in arc seconds. Correction cleans it up. Limit switch for faster rewind. The platform can slow down precisely as the limit is reached. It is much quieter during calibration. The limit switch enables the use of the DC motor. It uses an optointerruptor for highest accuracy. The limit switch repeatability means less tuning is required. Better bubble level mount. Heavy duty, and beveled to look better and not catch on the corners. The gimbals are strong and sturdy. Center restriction to keep the platform from tilting too far sometimes. After discussion with customers and calculations for their needs, including stability when travelling out of the design latitude range, I have made it possible to shorten the tracking time and keep the platform near the center. That way the telescope can be more stable especially if you travel more than 5 degrees north of the design latitude. To activate the center restriction feature, after assembling the platform and attaching the linkage, press the green button. The platform will seek the index, then slew to the center region, and stay in the center range. Aside from the restriction, it has all features, just a shorter range. Ticktock mode for all-sky photographs Allows tracking for a few minutes, then rewind and track again, all night or for a specified number of cycles. Allows you to make adequate photographs of meteor showers with sharp stars for instance, or sharp panoramas of the sky. Part 3. Software changes to the features and functions. Immediate led indication when power is applied, to provide positive feedback when connecting the power supply. The display is easier to dim and can be brighter than before. It can be seen outdoors in the daytime now. As long as the sun is not directly on the display. A single button press is all it takes to start the platform. Once the linkage is attached, pressing the OK button on the control initiates the sequence which starts tracking, with no other intervention required. The sequence consists of: Sensing the limit switch and advancing to clear it. Approaching the limit switch to detect the exact position of the index. Optionally seeking forward towards the center if the center restriction feature was activated (by pressing the green button instead of OK) Starting to track, at Sidereal rate, and announcing the onset of tracking via a beep-tone sequence. Fast guide speed correction Regular fine guidance from the remote is at +/- 0.25xthe current rate. For Sidereal tracking, the correction rate is 1 arc minute per 16 seconds. Fast guide speed correction is activated by pressing the SAT key on the remote. The slew rate is then 5 times sidereal for fast centering at the eyepiece while tracking. More precise timing Adjustments have been made to take into account the time it takes to execute the commands, especially during undo commands. Smart undo allows you to undo a recentering command The yellow button can get you back tracking after a mistake or an excursion. Smart undo allows you to undo a power cycle - slew back to the same place and set the same correction parameters and speed adjustments. Smart undo allows you to undo pausing the platform You can easily pause the platform to see which way and how quickly the stars would be moving with no tracking, or to for instance follow a geostationary satellite. Press yellow to start tracking again, and SkyStopper will slew to recenter whatever was in the eyepiece before pause was pressed. Re-center the actuator when slewing the platform The triple axis design allows you to make adjustments to telescope pointing in all directions. To ensure that you always have the best range, the actuator re-centers itself when you slew the platform. Separate index command for the actuator The actuator limits must be found if it was not centered at power-up. This is a lengthy process which can be initiated when it&apos;s convenient for you to do so. This means that all basic features of a single axis platform are accessible from the pushbutton on the controller. Actuator retains knowledge whether it was centered before the power cycle This speeds up setup next time. The benefit is that the actuator is ready to use sooner after power up. Balanced power based on the measure of the power supply The minimum voltage is 10.5 VDC for operation of the motors. The controller senses the voltage and adjusts the strength of the control actions. Totally configurable rod pitch and motor resolution Allows the controller to be used with any motor or drive rod. And a growing list of legacy platforms. Configurable wobble compensation with quadratic interpolation 8 points along the travel can be adjusted for phase and magnitude. Configurable ability to correct the limit switch phase allows the platform to be precisely adjusted even if your scope weighs it down more than expected. To adjust the phase of the limit switch, while stopped, adjust the position of the threaded rod to have the screw straight down, and then type 111 <-PR then press and hold green until it beeps. Configurable settings for the PID terms in the motor controller allow tuning for odd power supply voltages. Configurable settings for the limit switch allows recalibration of the limit switch after customer replacement if it is ever damaged. Digi-key part number 365-1725-ND. Part 4. The SkyStopper Equatorial Platform also has new methods of providing status. Beep when the rod phase reaches zero for precise calibration. This cancels the wobble action of a slightly bent rod and allows evaluation of the rate during calibration. This is used during speed calibration which is done before wobble calibration. Metronome clock. The SkyStopper has a computer and a speaker. If you want to time something, there it is. It can be used for manual timing of transits, for instance to determine if a point of light in a star field is actually an asteroid. It beeps quietly once every 2 seconds, with a special beep on the 10 second and 1 minute marks. Song tunes to indicate which speed it&apos;s going Now, if you are as old as I am, you can recognize the songs and know how fast the platform is going. If not, just know that it starts out at sidereal speed. Command acknowledgement beeps that reflect whether you are in turbo adjust mode. Whenever the controller receives a command, it can optionally beep to indicate that it was accepted. There&apos;s 7 levels of mute to eliminate beeps if for instance you want it to be quiet so you can listen for something else. Direct readout of guidance adjustment factors. There is an unpublished way for the display to show all the numbers for analysis. Part 5. Improvements in testing. In addition to electronic improvements, continuous stress testing has turned up some issues that may affect the mechanics years from now. Stronger linkage. When the telescope is unbalanced, the weaker magnet was activating the linkage safety feature and letting go. Now the linkage magnet is about 4 times stronger, but still easy to remove when it is needed, or if you pick up the platform rocker without the base. This allows manual rotation of a stiff telescope without releasing the linkage.